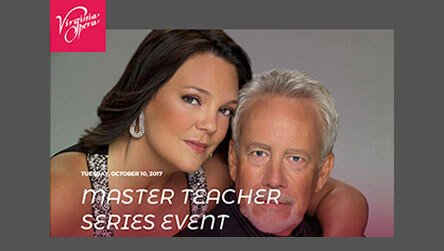 Master Teacher Series Event! Free and open to the public! Tuesday – October 10, 2017 – 7 PM at the Dominion Arts Center, 600 E. Grace St, Richmond, VA 23219. Experience the preparation process for Virginia Opera’s Herndon Foundation Emerging Artists as they advance their professional dream with our Master Teacher series. Jill Bowen Gardner & Jake Gardner who will be starring in our production of Puccini’s ‘The Girl of the Golden West’ will provide instruction and advice to the young singers. Enjoy light refreshments with the artists following the presentation.